We're excited to be throwing a party at Perth's premium location for summer pop ups! At QUAY TO THE AMAZON in the iconic Elizabeth Quay overlooking the water & underneath the city's lights. We’re bringing along a quality line up for your dancing pleasure! Nicole Millar (Syd) will be behind the decks DJin & singing a few of her fav songs on stage + support DJ's elise keddie and DAWS. Nicole Millar has just introduced Excuse Me, her anticipated debut album. Pop music with bite and electronic production collide on Excuse Me for songs that bleed glitter, guts and neon pink. Nicole wrote on every song on the album, working with producers Sable, Dan Farber, Hoodboi, xSDTRK and Kyle Shearer to bring her words to life in studios between Sydney, Stockholm and L.A. 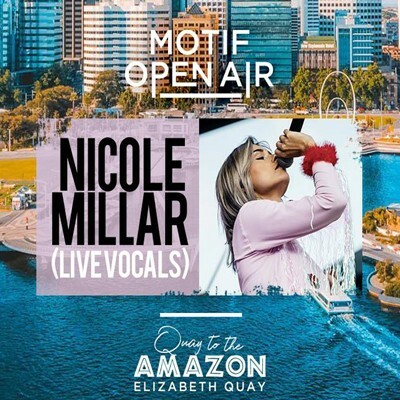 Things have been non-stop for Nicole Millar Since she stepped out as a solo artist in 2016 with her EP Tremble, which went Gold in Australia and amassed a cool 8 million spins on Spotify. As well as scoring massive radio play with ‘Signals’ and ‘Blindfolded’, Nicole’s been picked to tour with Troye Sivan, support SZA and fit in sets at Splendour in the Grass. It’s been a rapid ascent for the girl who broke through as the voice of Peking Duk’s ARIA-Winning, triple j-conquering, three times Platinum hit ‘High’ in 2014. With Excuse Me, 2018 is sure to be her biggest year yet.